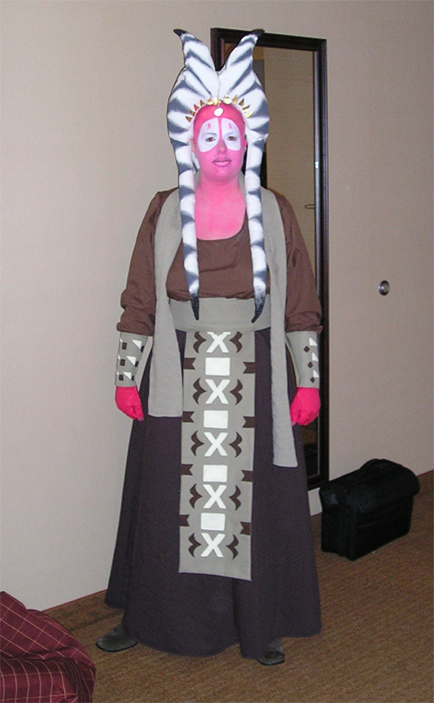 Shaak Ti wears renn faire garb! I swear! 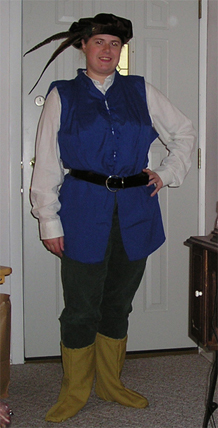 It's a chemise, a skirt, a belt, and bracers, for crying out loud! Thus thought I when, looking at the Episode III action figure, I opened my big mouth and said I would do the costume. And that was true enough. I was actually so familiar with the clothing part of the costume that I was able to whip it off in two days and without any patterns. The truly impressive part of this costume was the horn/headtail headdress. I'm definitely more proud of it than any other part of this costume. I'll start with the clothing, though. The brown top is a simple chemise-type pattern made with a cotton-poly blend fabric. The neckline, which is slightly narrower but just as low as a chemise, is finished using bias tape of the same material. The skirt is made of a bottom weight cotton weave. Four wedge-shaped panels gave it a nice flare. The bottom hem is a rolled-edge and the top is finished using a bias-tape like method. There is a zipper in the back. The belt and belt flap were a combination of two rectangles, both with a backing of the same material. The belt portion includes interfacing to help it keep shape. The pattern on the flap is painted using acrylics. The bracers are simple wedge shapes with a layer of interfacing and, again, painted with acrylics. 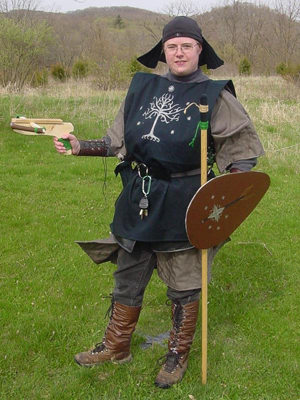 The stoll was made using fabric left over from my Siri Tachi costume. I sewed a cross-hatch quilting pattern into it as well to give it some interesting texture, which was an adventure when my sewing machine began to break thread every three inches or so. 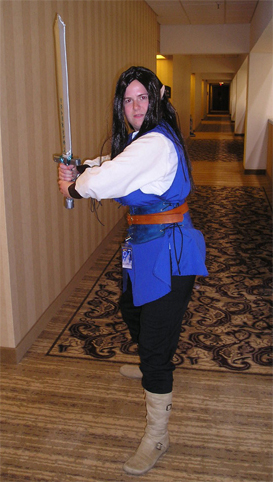 ~_~ The costume was then finished off with my tan jeans (not visible in the picture) and my knee-length brown boots. Now, I know you're expecting me to go into great and gory detail about the headdress. But really, I don't want to. It's unique enough that I don't want to give away all the secrets. The material of choice was a cotton broadcloth and there's interfacing and fiberfill involved. But how it stays on my head will remain my little secret. The jewelry was all hand-sewn onto the headdress. I had trouble finding anything the right shape for the gold sequins that outline the edges of the white, so I finally settled on cutting the bottoms of gold foil cupcake cups into the right shape. After my actual wearing of the costume, however, they ended up a little rumpled. I'll have to find an alternative. Oh, and I made gloves to cover my hands. Didn't want to get makeup all over things. And besides, this way I could have the silver fingernails via silver sharpie rather than trying to find silver nail polish this time of year. And with help from my dear friend Stacey, I had a wonderful makeup job on my face and neck. I definitely had the most fun while wearing this costume at the con (which is saying something, since I brought 8 different costumes!). I was stopped for photos several times and one person even asked me by calling me "Master Ti." I totally geeked out over that! By the way, if any of you reading this did get my picture, I'd adore you forever for sending a copy to me. This was the only one I managed to get on my own camera, sadly enough. This was my first time going to CONvergence and I have to say that I have never had so much fun at a con before. I didn't end up going to very much programming, but I hit a lot of room parties, talked to lots of people, and had a lot of fun just hanging out. The one piece of programming I did go to on purpose was a costuming panel. However, me and the people with me decided to vacate before we throttled the lady who mentioned the dreaded "bathrobe Jedi" as being a good idea. Let me tell you, folks; there's always room for improvement on a costume, there's always things you can do better, and there's always tricks you can learn. 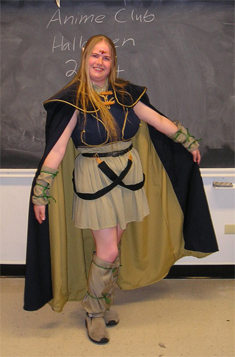 But there comes a point in the course of the costuming hobby where panels are just no longer a good idea. I guess I've reached that point. I brought eight costumes to the con and somehow managed to fit all of them in. How, you ask? By not leaving the hotel room in mundane clothing all weekend!!! 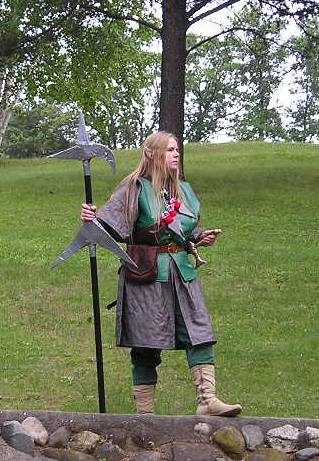 After that, I wore some renn fair garb with a remarkably green theme to it. No pictures, but I had a fun hat and ran around the con playing Matrix Tag's very first Neo! About half way through the session, though, I had to take a break and change. Why? Well, let's just say that many were the Matrix Tag players who heard me utter the phrase "dammit, Neo has bodice gather again!" Pink Ninja haak websight! Pink Ninja all stealthily like! 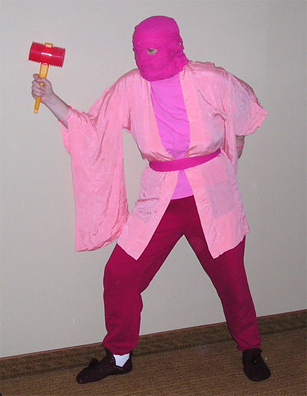 Pink Ninja wuz hear! Saturday morning saw the first convention appearance of my Siri Tachi costume. 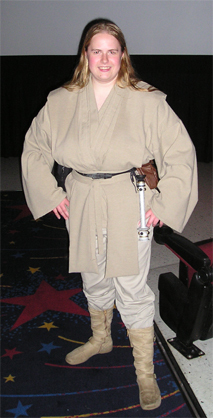 This costume was first debuted at a midnight showing of Star Wars Episode III: Revenge of the Sith. At one point, I even went with a couple friends across the parking lot to get lunch at Dairy Queen. They liked my outfit (for reasons passing my understanding, really; there were many far better Jedi wandering the con at the time), so they gave me free ice cream! Thanks guys! You rule! And that about wrapped it up for the weekend. I stuck around for closing ceremonies to find out what next year's theme was. According to the skit, it's either "space flight" or "real science." It was a little hard to tell. Funny skit, though. And I have to give a shout out to all the folks who played Matrix Tag. I was a black-headbanded judge for the rest of the sessions after playing Neo and I have to say that it was a total blast. Everyone who played and had such a good time owes a big thank you to Shan, the Architect. It truly is a fun game to play and it contributed a great deal to the blast I had that weekend. Kudos to all and I hope to see you all playing again next year. Page created on 7/8/05 by Berzerker_prime.